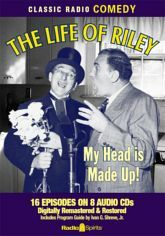 William Bendix is back as Brooklyn expatriate and aircraft riveter Chester A. Riley. This well-meaning, if lunk-headed, family man is fiercely loyal, profoundly loving, and impossibly stubborn. Riley struggles to get ahead at work, struggles to be a role model for his son, struggles to read the tea leaves of his daughter's love life�all while his wife Peg (Paula Winslowe) struggles to talk some sense in to him. Featuring the voice stylings of John Brown as both neighbor Gillis (the wisecracking sidekick offering staggeringly ill-advised counsel), and the local undertaker Digger O'Dell (who adds a wry gallows humor to the proceedings). This blue collar collection features sixteen digitally restored and remastered episodes - including several broadcasts not previously in circulation among radio collectors - and a Program Guide by Ivan G. Shreve, Jr.